The North American Dr. Vodder School (Victoria B.C. ), of which Michele Keleher is a certificate holder, requires each practitioner to complete a minimum of 160 hours of training. This consists of: the theory of the lymphatic system, hands-on practice for tissue manipulation, bandaging exercises, the use of MLD/CDT in treating scleroderma, arthritis and other edema conditions and a rigorous final examination. All students must sign an agreement which states that they will not treat lymphedema patients until they finish and pass all requirements for certification by the Dr. Vodder School. Consegrity practitioner on June 14, 2002. Michele is certified by the Lymphology Association of North America (LANA) as a certified Lymphedema Therapist. It is important for each patient to question both the training and experience of any potential therapist before agreeing to a treatment plan. There are other sources of information available, such as the National Lymphedema Network and NAVALT. These references and links may be found on our Other Resources page. If you wish to speak with one of our former or current patients, this can be arranged by leaving a message on our e-mail. In 2000, Michele Keleher was recognized by the National Lymphedema Network for her work with lymphedema patients by being given the Lymphedema "D" Day Award. 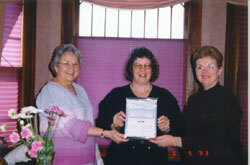 Presenting the certificate to Michele (center) were, left, Dorothy A. Bowes, Philmont Lymphedema Support Group and Joan Sheehan, right, of the Capital District Lymphedema Support Group.